We think we know our stories well because we’ve told them so many times– tales of the choices we made, choices we didn’t make, & things that happened that were out of our control. Time changes our stories, smoothing the rough edges of some experiences; eroding others until they fade from memory; & leaving some to stand as monuments to who we “think” we are. We believe what we can articulate is the whole truth about ourselves. Quite often, words are not enough & we must use a different modality to reveal what lies under the surface of our story. The deeper meaning of who we our… our Pure Selves. Each of us is a pilgrim on a sacred journey, where the past shapes the present & the future… & even doubles back on itself at times. Yet, the past does not define us. The past is the part of the path we have traveled & the present is the place on the path where we are standing at this moment. Seeing life as a sacred journey doesn’t erase painful memories but it softens them & helps us view each experience as a source of wisdom or at least, a lesson learned. Replace the tendency toward judgement of “good” & “bad” with the understanding of “wisdom gained” & “lessons learned”. I believe the intellect can get in the way of spiritual growth. We want to analyze situations to get clear, easy “answers” as to why things happen. Sometimes, the only way to get beyond the logical mind is to try a non-logical approach. 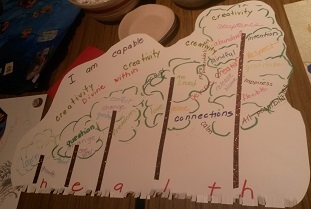 This is why I challenge workshop participants & clients to use creative expression to more intimately connect with their authentic selves, diving into the deep waters where the heart & soul can speak their truth. My Sacred Journey: a treasure map of experiences & people who have influenced my spiritual growth. 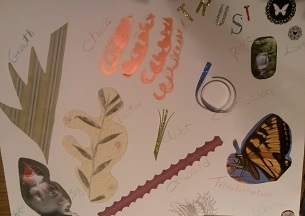 I developed Sacred Journey: Personal Mapping as a visual way for members of a newly formed womens’ group to introduce themselves to one another & beginning forming meaningful connections with one another. I explained that there would be three components to their maps. 1. Images or words portraying their spiritual path to this point. 2. A representation of where they are, spiritually, in the present moment. 3. A symbol of where they would like to be, spiritually, in the near future. That’s it. That’s all the direction I gave. You can imagine the variety of reactions I got from each woman, depending on her comfort level with artistic expression. The point of Sacred Journey Maps is to express something the intellect cannot easily explain with words. Creative expression gives voice to the soul. Something surprising & yet recognizable emerges, when you act from heart rather than the mind. That something is Pure You, your higher self. You know it when it happens because when your soul speaks through the creative process, there is a physical reaction in your body, usually the solar plexus region or a tightening in your chest… the heart chakra. There is recognition & an acknowledgement that this is your truth. After a guided visualization designed to prepare the way for the soul to speak & a brief period of meditation, I set the women free in a room full of art supplies– magazines, adhesive-backed letters, inks, paints, markers, embellishments, scissors, glue, & large sheets of Bristol board. 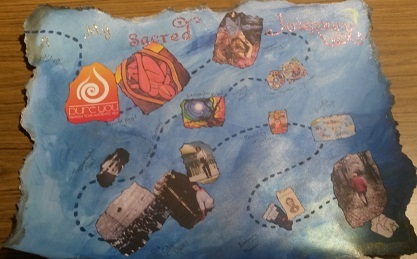 The images below show the wide variety of Sacred Journey Maps made by the participants. Each map is a powerful reminder that life is a sacred journey. 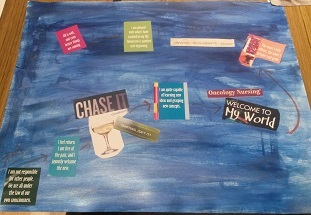 This entry was posted in Art and Soul, It's All Connected: Spiritual Musings and tagged art, journey, life, map, sacred, self-awareness, self-expression, spirit, spirituality, women by puresusan. Bookmark the permalink. What’s up, this weekend is good for me, because this point in time i am reading this great educational post here at my house. Glad you enjoyed the post. 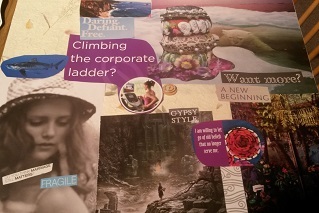 Mapping and vision boards are great ways to see where you’ve been and where you are going. Thanks New Caney TX 🙂 I’ll keep doing the best I can. Are you a blogger?